When we left Louisiana, we were headed to Oklahoma, but on the way I wanted to stop and show Max one of the prettiest areas in southeastern Oklahoma. Many people think of Oklahoma being flat and only having wheat fields, but that is so far from reality. Only in the central and northwestern part of the state do you have flatlands and wheat fields. We have hills (they are actually called mountains, but I refrain since they can't compare to the Rockies and the likes), lakes, sand dunes, caves and waterfalls. And we even have some of the most beautiful fall colors around. Every fall people drive the Talimena National Scenic Byway, a 50 mile trip through the Ouachita Mountains from Mena, AR, to Talhina, OK. Most of the 50 mile byway runs along a ridge. I'm at one of the higher lookouts and looking behind me and down of the scenic drive. It is 50 miles of breathtaking views. Now everything is green, but in the fall, the colors run from green to yellow to orange to red, all at the same time. It doesn't get any prettier. These mountains have been traveled for years. Orginally by the native Indians who lived here before we forced all the eastern Indians out here. Even in 1832 the military was making roads through this area. The area was nicknamed Winding Stair Mountains because of the winding, steep roads needed to traverse through the area. Natural Springs throughout the area attracted not only the wildlife and early people, but once the area became settled, also drew the outlaws. The area was so wild, the outlaws could escape in the area and hide out easily, but springs like this drew them to a central location. I didn't drink out of it, but the water is still flowing. The structure around the spring was built by a 1930s CCC camp. You can see remains of their improvements throughout the drive. They built shelters and even a campground which still exists. Smokey Bear had just finished giving a talk to a group of school kids, but he agreed to let us get a picture with him. We missed the ranger show about raptors, but here this hawk is just enjoying being out of his cage. This is one creature I wouldn't want to meet up with along the trails. He tried to cross the road and didn't make it. And no, we did not hit him, we found him like this. There was a dispute on the state line marker. Before Arkansas and Oklahoma were states, this area was originally given to the Choctaw Indians when they were forced here from their original homes in Mississippi and further east. A survey marker from 1825 was discovered in 1877 to have been placed too far west, taking 136,000 acres away from what rightfully belonged to the Choctaw Indians per the treaty of 1820. It took years of dispute and negotiations before the Choctaws were compensated for the loss of this land. Even today, there is still dispute about the correct boundary lines. The Rich Hill Fire Tower. The original fire tower was only a platform on top of a pine tree. It was replaced with a wooden tower in 1910. Somewhere in the 1920s it was replaced with another tower and again in the 1940s. This tower was built in the 1950s and was in use until the 1970s. This information came from the signs on site, which is slightly different from what online info says. A few interesting facts about this tower, it is 65 ft tall, but on top of Rich Hill (altitude 2681), it is the 2nd highest point in Arkansas. When volunteers are available during the summer months, you can climb the tower for a view of the Ouchita Mountains. In was still early May and no volunteers were there to let us climb the tower. Our sightseeing is over and it's time to head to Ft. Gibson to see my kids and grandkids. There are just some places we have to visit anytime we are in this area. One of these is the Cafe Des Amis in Breaux Bridge. On Saturday mornings they have the Zydeco breakfast from 8-11, but if you aren't in line at 6:30-6:45, you might not get a table when they open at 7:30. We are always there early. The line is already down to the end of the block. We got down there and found our friends Kathy and Pete were also waiting. And we invited another man waiting, who was there by himself, to join us in our table . While we were waiting, Kathy demonstrated how she plays the washboard. Lyn had to try it. We are finally in and the band is beginning to play. I've been coming here for the past 4 years and this lady is always there selling her necktie washboards. Lyn decided it was just the thing for her. When you are not eating, it's time to dance. Pete teaching Louise some cajun/zydeco steps. We made friends with these guys while waiting for the cafe to open. They were here for the Crawfish Festival, too. But hey, this isn't the last we see of them. 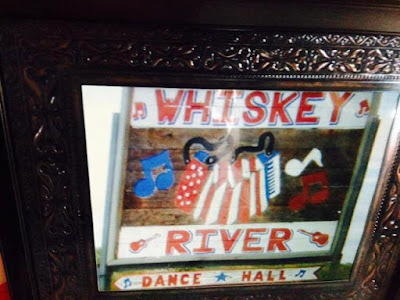 The other place we always like to go is Angelle's Whiskey River Dance Hall in Kendall, LA. And guess who we saw there? Our friends from Cafe Des Amis. Located right on the Atchafalaya Bay, this is the view from inside the dance hall. We were there early and not many people had arrived yet. It's a pretty good size dance floor and it gets quite crowded when everybody is out there stomping to the cajun/zydeco beat. And then I realized the entire dance floor is located over the water on stilts. No wonder the whole place bounces when everyone is dancing. It literally is bouncing. This is the same shot as earlier, but it's not empty anymore. I told you it gets crowded. Combat dancing deluxe. The band was Geno Delafose and the French Rocking Boogie. 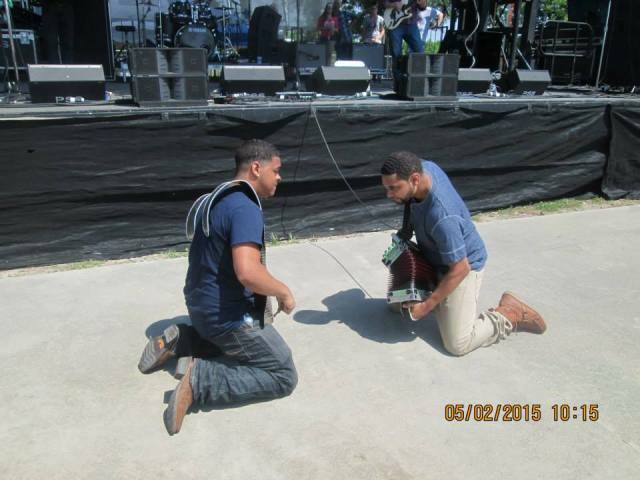 They also played at the festival. We were outside when Geno arrived and he let us get our picture with him. He is a very nice person as well as a great musician and singer. 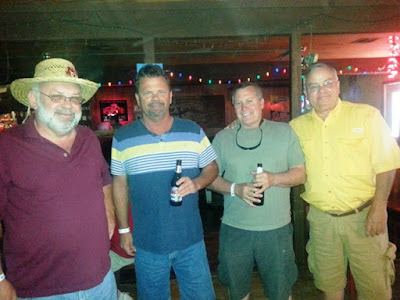 Some of us were getting hungry and they don't really sell food at Whiskey River, so we headed down the road to Pat's Fishermans Wharf Restaurant and the Atchafalaya Club. They also had music but since we were wanting to eat, we chose to go to the restuarant instead so we could visit. I guess it's time to say goodbye to cajun country. Now it's time to head north to see family before heading east for the summer. Just to let people know, I am way behind on my blogging. The Crawfish Festival was in early May and it is almost July. But I'm trying to get caught up. 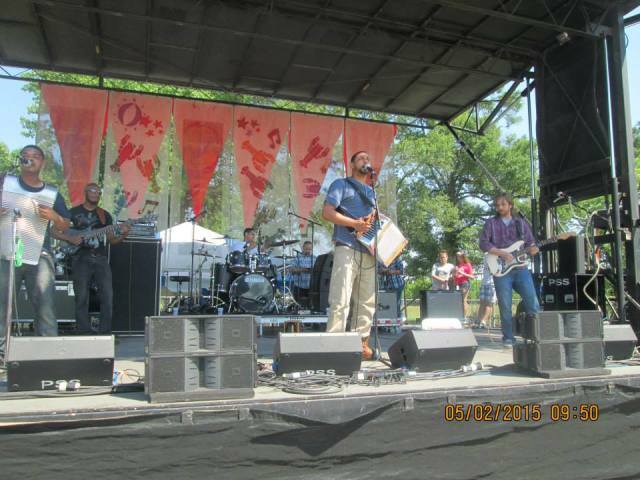 The first weekend of May in Breaux Bridge, LA, is the Crawfish Festival. 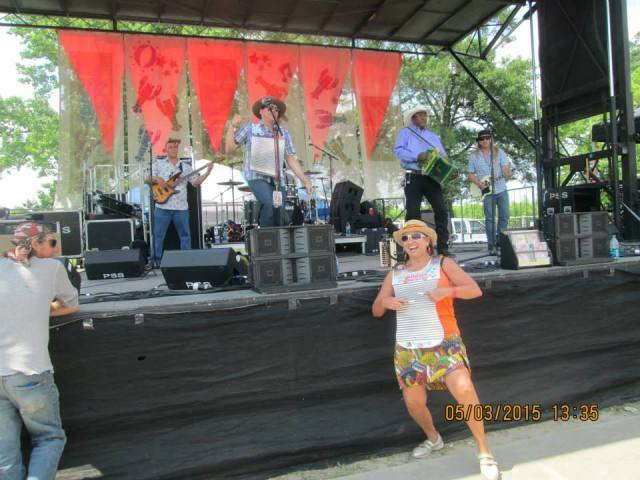 Three days of cajun music, cajun dancing, cajun food and lots of fun. We camp out behind Parc Hardy (where the festival is held) and we can walk in and out as often as we like. Here are a few of our favorite bands. They really get into their music. But it wasn't all music, there were crafts, too. I wanted to buy this, but where would I hang it? And Roy is always there with his wonderful lemondade. And my favorite, the crawfish ettouffee cookoff. We kept hanging around watching them prepare this wonderful delicacy, just waiting for the time they started giving samples. And that time is now. Yum! Saturday morning we were waiting for the parade to begin. Finally. We could hear it and see it blocks down the road, but it seemed to take forever to get where we were. Most of the parade has gone by and you can see how successful we were at the amount of beads we are all wearing. And my cup is full of candy, too. The festival is over and we all head out tomorrow. Our next stop? Port Aransas.